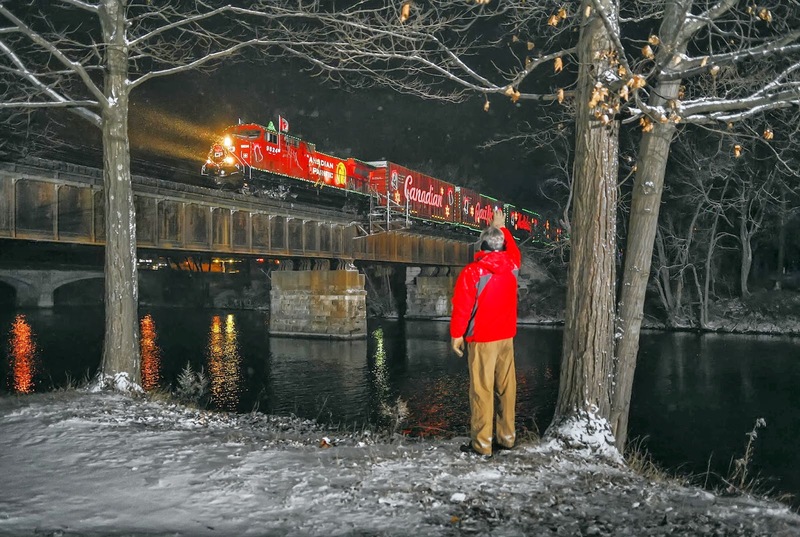 The southbound deadhead move of Canadian Pacifics’ Holiday Train ran overnight and I had planned to shoot it coming off of Rogers Island in Fort Edward, NY. Greg Klingler had pointed the location out to me earlier and in spite of the spots shortcomings, it offered a grand view of the train on the open deck bridge crossing the Hudson. The shortcomings? I would have had to stand on a narrow highway bridge with the light stands holding the flash units taped to the bridge railing. I had looked the location over during an earlier visit and deemed it doable. Then I arrived early this morning. I make a mistake turning around to check if a train is waiting on the siding at the station for the Holiday Train to pass by. I pick the fire station driveways to turn around in.................while the Fort Edward policeman drives by. This results in my being stopped for not using my turn signal early enough at a stop sign, (ok, I was lost) and while the officer interviews me he spots my scanners on the front seat. The conversation turns toward how it is illegal to monitor police frequencies in N.Y., and I agree, volunteering to automatically scan my frequencies monitored while the officer transmits on his radio............five feet away, promising my scanner will not lock on any frequency he is using. The officer transmits..............my scanner locks on a frequency. I stare at the display reading 160.635 the MM&A freq. The officer says to me “That’s Illegal!” I blame the fact he is transmitting so close for my scanner locking on a freq. and ask him to have his dispatcher call him. He agrees to try this. This time my scanner acts normally and after further conversation he provides direction back toward Rogers Island and we part ways. Arriving back at the spot Greg had recommended to me, the bridge coming off of Rogers Island, I don’t like the looks of it and veto the idea. I’m not a big fan of standing out on highway bridges late at night no matter the view provided, never mind narrow ones! Besides, the composition over at the bridge coming onto Rogers Island is stronger I tell myself, what with the pair of trees to frame with. It turns out to be the right decision, as I no sooner get set-up around the two trees when it starts snowing and blowing with temps in the low thirties! Besides! Some compassionate, thoughtful and kind person has surgically pruned tree branches here opening up the view enabling me to shoot from a much higher vantage point now! So..........it’s 03:15ish...........I’m standing here holding the golfing umbrella from LaGrange over the camera on tripod due to the snow, and car headlights break the spell as I wait. A car swings around the blind corner and under the bridge behind me, to park off to my right. The driver gets out and I recognize the voice saying “Hi Gary”. Greg Klingler walks up to greet me. We talk for a while over night photography and the Holiday Train, then it dawns on me Greg might be a good addition to the photo here. He agrees to try it and stands next to the tree on the right, first too close to the camera, too dominating in the composition, then he takes a couple steps toward the river and wow, what a difference it makes! Remembering what to do from when he posed on the platform up at Riverside for me several weeks back, Greg marks his spot and walks back to check the photo in the camera. Some twenty minutes later I hear the car scanner picking up the crew of 9824, the Holiday Train locomotive, talking to the North End Dispatcher...........clearly, like they are nearby. I send Greg to his position on the river bank and we wait as I remind him in years past here, the only warning one gets is when they blow for the crossing above us at the station. Which provides maybe thirty seconds warning before the head end is on the bridge when traveling at passenger train speed! Hence my hovering around the camera. After several long minutes, we finally hear 9824s air horn, but it’s not the intense sound associated with high speed running, it sounds like the train is creeping along! Then nothing happens. The headlight glow I could see above the bridge disappears! A minute, then two passes by and we joke uneasily that the crew is doing this just to add to the drama for us! lol! Now the headlights are back on, and we can hear the 9824 starting to pull. Entering onto the bridge at around twenty mph, Greg waves and I watch as the pilot plow progresses slowly across to where a silent press of the shutter release sets off the lighting, capturing the scene! Viewing the resulting photos afterwards, it is apparent how much of an improvement Greg provides! Shot on November 26, 2013 at 04:32 in Fort Edward, NY. Very special thanks to Greg Klingler for his contribution to the photo! Please enjoy! Comments are welcomed. I Do Work Ya Know! I'm glad you enjoyed Rob. 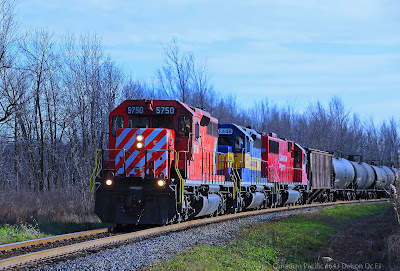 I was with a friend from Vermont that wanted to take some CP shots and be introduced to the ``switch lady``... We were at Farnham for the hi-rail vehicles(bidders) parade that were touring the MM&A, when I heard Lacolle RTC about the meet at St-Mathieu. Perfect timing as we were only 30 mins from Delson. Taken on November 7, 2013. 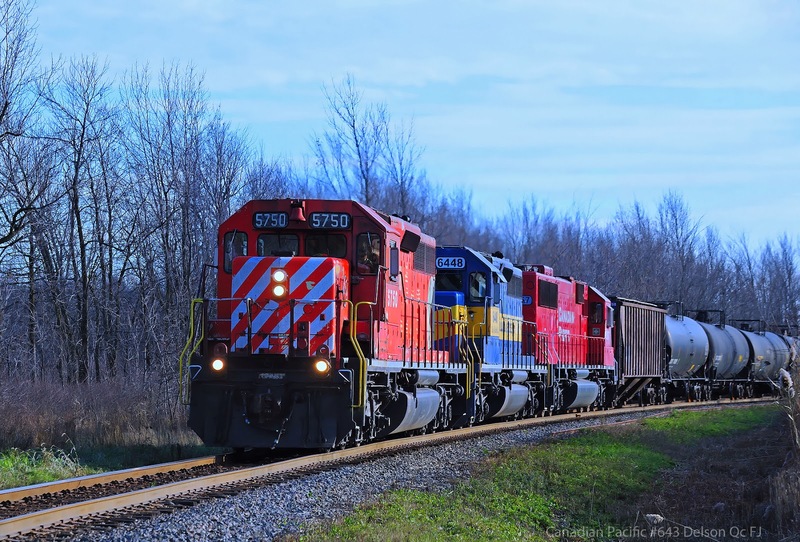 643 approaching Delson heading to Montreal with Rob Dennis at the throttle.